Well, my last week on the mission was just as good as the first one, we were able to work a ton and god blessed us with success, we were lucky enough to find this family, Rosalia (mom), Krisnara and Esdras. The way this family was found happened like this, about 1 month ago Rosalia's son was killed in a motorcycle accident. At the time the missionaries were teaching her neighbor Socorro, Socorro is Rosalia's best friend, and she sent the missionaries over to her house to explain the Plan of Salvation to her, because she was so upset about everybody telling her that her son was in different places.. We taught her all the lessons and she was able to visit the church she told us that she felt a peace inside of her as she sat through the sacrament meeting. after 2 more weeks of teaching her she felt a strong desire to be baptized, i was lucky enough to be able to baptize this marvelous family my very last day on the mission! I have already called them and they were all Confirmed members of the church the following week, and super excited about their future in the church. Rosalia cannot wait to go to the temple for the first time! 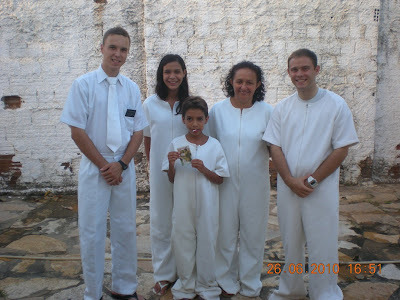 Here is a picture of their baptisms!! Getting off the tiny airplane!! Thanks for the homecoming family!!! This past week in Nova Descoberta (the town we live in) While a garbage truck was turning onto our street something CRAZY happened, the ground opened up and ATE the garbage truck... many people ran to see what was going on, the national news was even there to cover the story, it took many many hours to pull the truck out, but when it was finally freed the crowd clapped and cheered!!! haha here are some pictures!!! SBT interviewing.... WE HAD THE SAME IDEA!!! well finally its here, we have had the OPEN HOUSE of our new stake center this whole week, we have been handing out flyers and inviting people to visit the open house, i have even developed a nasty sunburn, but it was all worth it, we had over 250 visiters and tons and tons of people interested in the church. here it what went down... so anybody who showed up at the church would sit and watch a short movie about the church while more people came, then they would form a group and a guide would be assigned, this guide then took them on a TOUR of the church, stopping in each of the rooms where there was somebody prepared with a short 5 min explination about what happenes in that room.. ex: YMYW Elders, RS, primary, geneologia etc.... it was awesome... then at the end, us missionarys would talk with them about any doubts they had and we would write down their address so that we could visit them and bring them the book of mormon. not only the open house was a success but also in the field, this week we had 2 baptisms... while the WHOLE ZONE only had 3 baptisms, 2 of them were Narrara and Rubia baptised by yours truly... elder Clark! Rubia is a super super super super smart woman... she speaks chinese, english, french, portugues and she already has a degree in law and is finishing up her degree in Petrolium at the local university. she has already lived in many countrys and is currently working as a substitute JUDGE!!! yeah, so her story is pretty awesome! sunday she arrived 2 hours early to "prepare spiritually for her baptism" (my first baptism to do that) ps. rubia and narrara were the very first baptisms in the new stake center, and i was the first to baptise in the history of the building... i hope many many many more baptisms are to come!! !